Today’s post will NOT be the prettiest you’ve seen on the blog (thank you, dated green floor tile), but… this space definitely deserves a medal of honor! 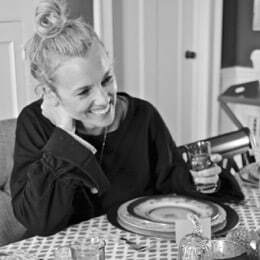 Thanks to Brenna for rallying an organizational army, we’re all sharing some of the secrets behind our more organized spaces around our homes, so settle in for some tidy rooms! Our house doesn’t have a substantial front or back hall closet. 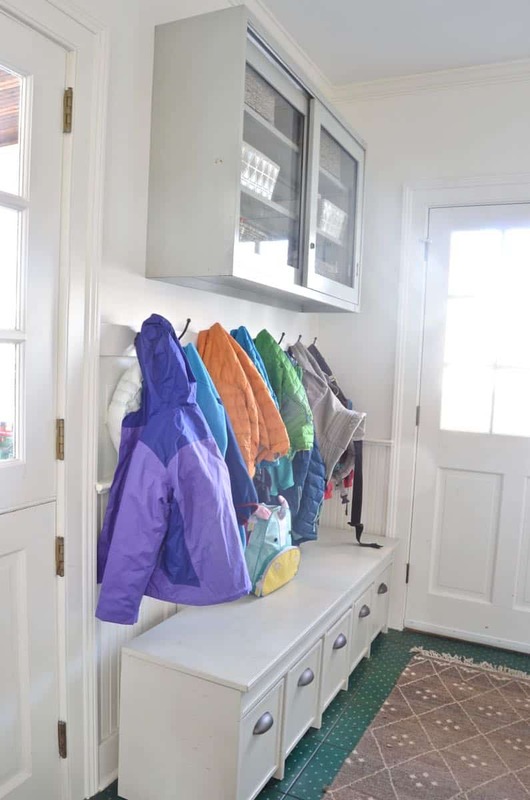 There’s a small closet in the kitchen that fits Mark and my coats, but I needed to make sense of the mudroom and make it work for the five kids. Soon after we moved in, I built that custom bench with five wheely storage boxes, added a row of hooks above and mounted that fun lab cabinet I grabbed at a salvage joint for $60. 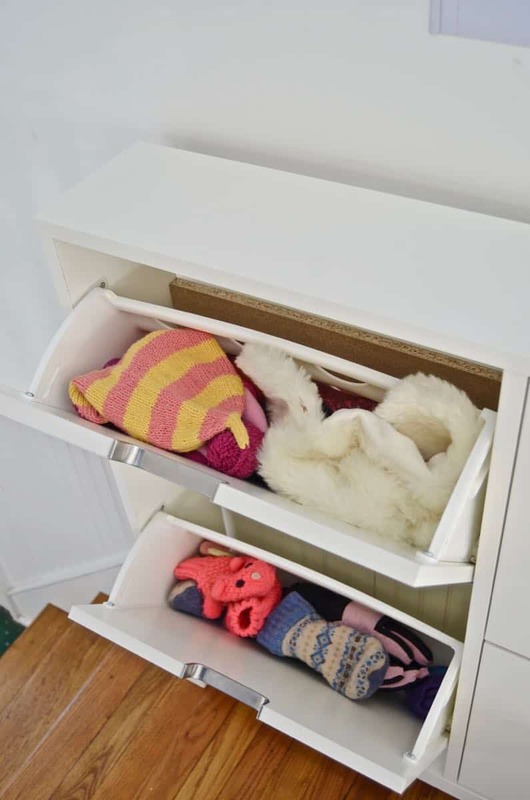 Even though those pieces are essential… here’s a look at how we USE those pieces to stay organized as a busy family of 7. Let’s start with the bench, because that’s the most obvious. 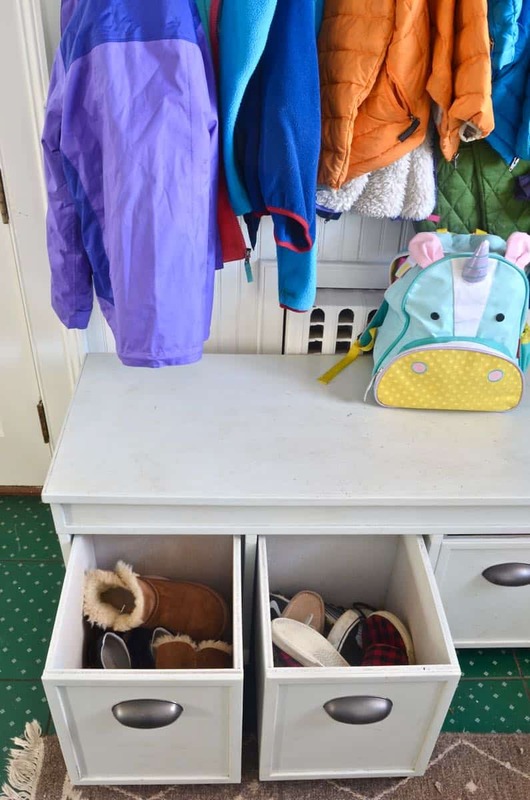 Each of the kids has their own drawer for shoes… they don’t always remember to leave them there, but they’re getting better. The only thing that doesn’t fit there are the boots… but we have a spot for them so keep reading. The seat of the bench is hidden storage… right now I have their snow pants folded in there, but it’s a nice little overflow area for things we don’t reach for all that often. Hanging above the bench are hooks. Lots and lots of hooks. 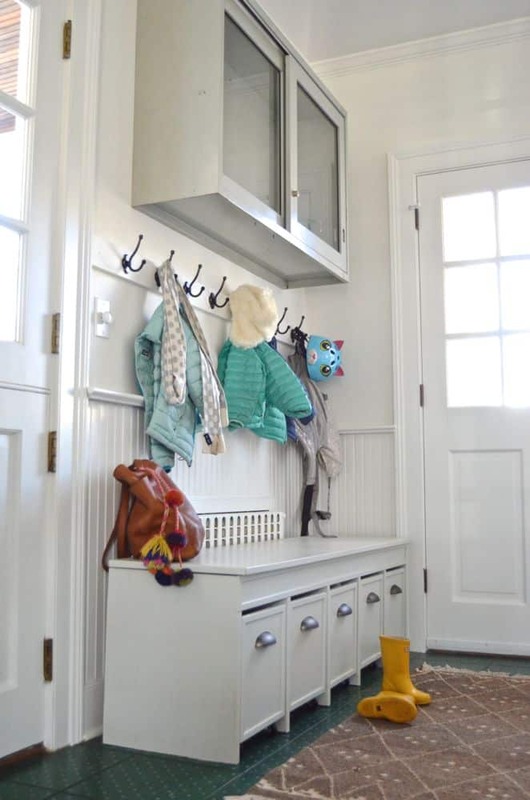 I love hooks for kids because they’re so easy to use! 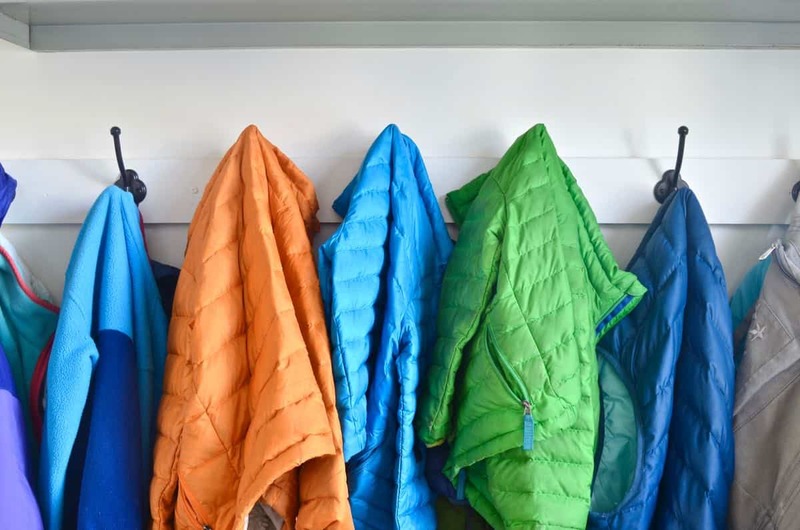 Everyone in the family has a hook and they can easily fit their winter coats, raincoats, fall vests and backpacks. The lab cabinet is a great landing spot for both the things I want to keep away from little fingers OR things that aren’t all that pretty to look at… For example, the baskets in that cabinet conceal sunblock/ bug spray, clean up bags for the dog, extra diapers… you get the drift. Tucked in the corner are two more containers for umbrellas and bike helmets/ roller blades. We used to store the helmets and roller blades in the garage but they always ended up migrating into the house because the little kids couldn’t get them on and off without help. 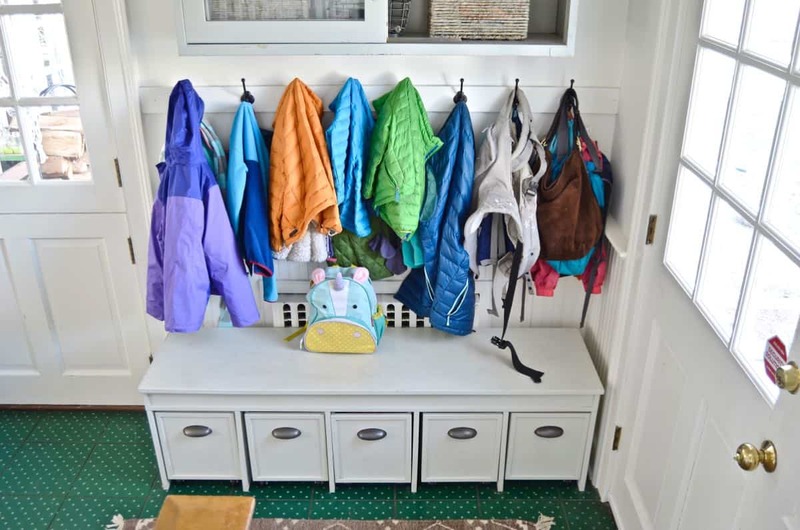 A coat rack in the corner can be a little dangerous as it ends up piled high with coats and scarves and hats, but I try to put everything away every few days so the rack is actually a useful place and not just a dumping ground. 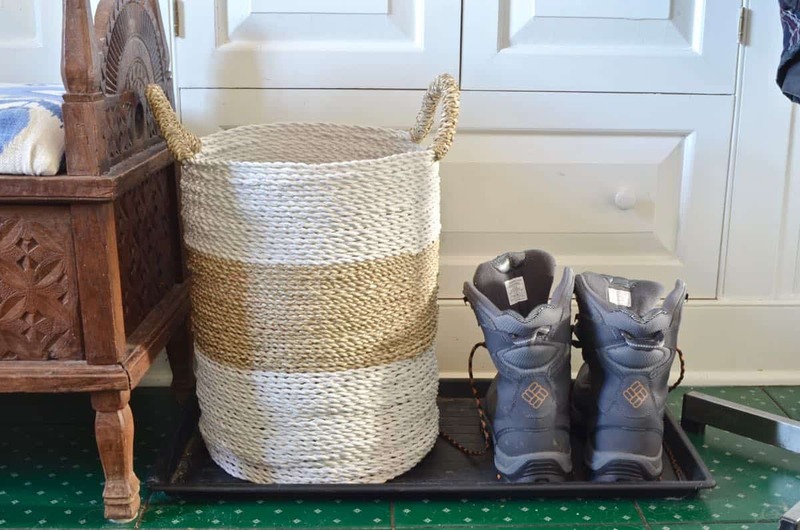 Below the rack is a simple plastic tray that I pull out when wet boots need a place to dry. That other basket is just there during the winter and it holds Mark and my scarves and hats and gloves. I bring it up to the attic in the summer. The little cupboard right there is the only ‘closet’ in the mudroom. 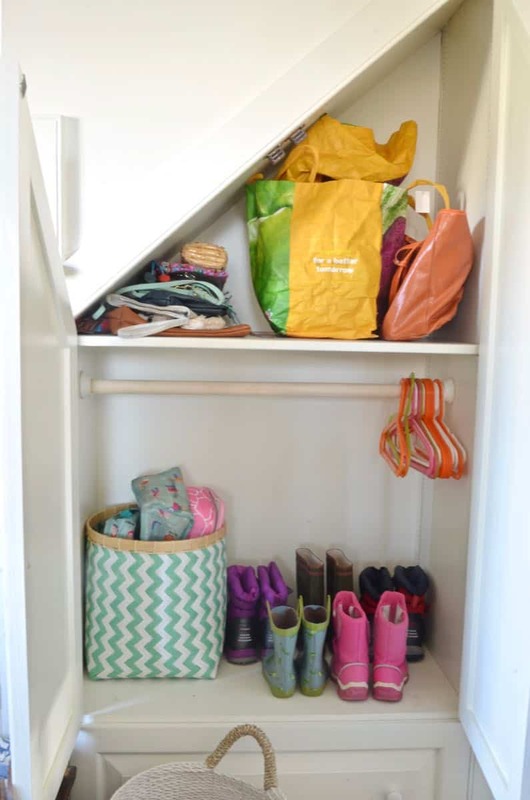 Not helpful for coats and whatnot, but we have a basket with the kids’ lunch boxes in there as well as a shelf for me to store reusable shopping bags. 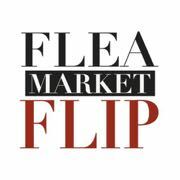 This is also where I tuck away snow boots this time of year. That thrifted wooden bench has hidden storage inside if you lift up the seat… Right now it holds baseball hats and rogue knee pads and wrist guards but in the summer, it might change a bit. Last but not least… I cut away some of the molding at the foot of the stairs to fit that Ikea shoe cabinet, and we use that for the kid’s hats and gloves. The girls have one side for their gear and the boys have the other! 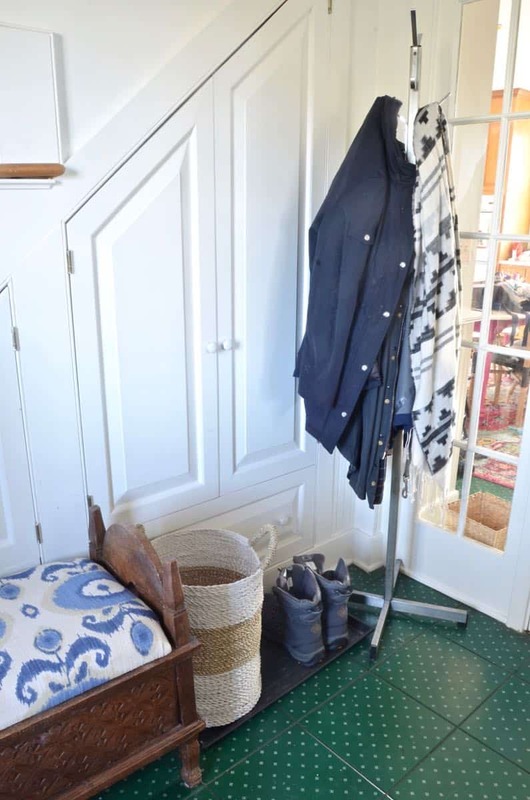 The basket on the landing is a holding area for all of the socks and shirts and clothing that need to go back upstairs. If I forget to check it, it ends up cluttered with random toys and lego parts… but I always try to have some sort of container by the stairs to help corral items on the wrong floor. 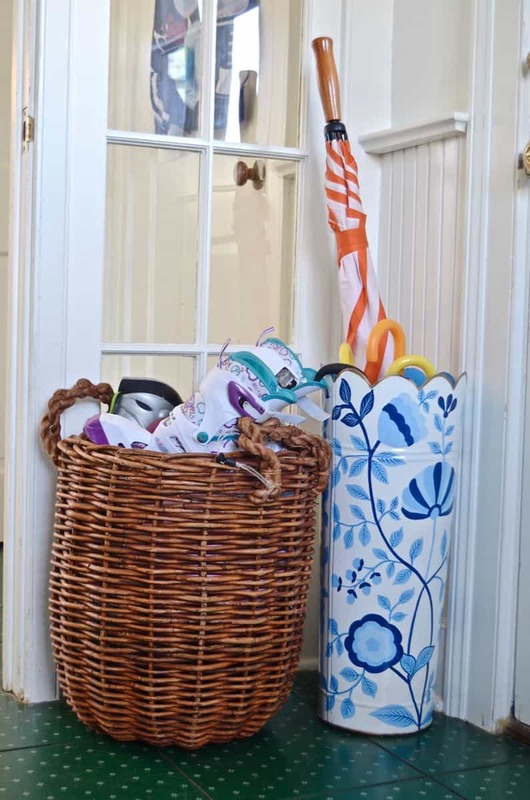 That’s the inside scoop behind our mudroom. Obviously the space is fairly specific, but I always get ideas from other people’s systems so hopefully something about these landing zones sparked a little something for some of you! 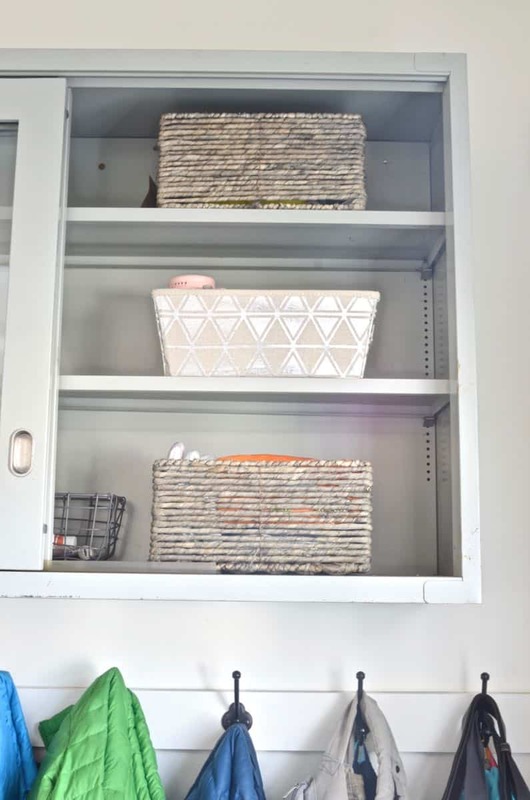 Check out everyone else’s organizational mojo below… I’m trying to convince them all just to come to my house and organize ME, but so far, no takers. 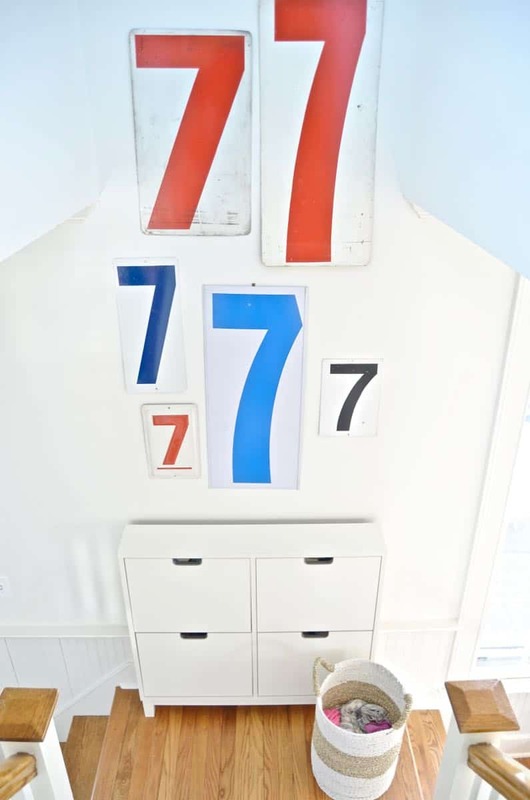 It is super impressive that you can organize a family of 7, during the winter with all of that stuff! Seriously, well done! And I kinda dig the green tile….. everything old is new again, right? Seriously I love the green tile. Own it girl! They’re darling. And thanks for the tips. 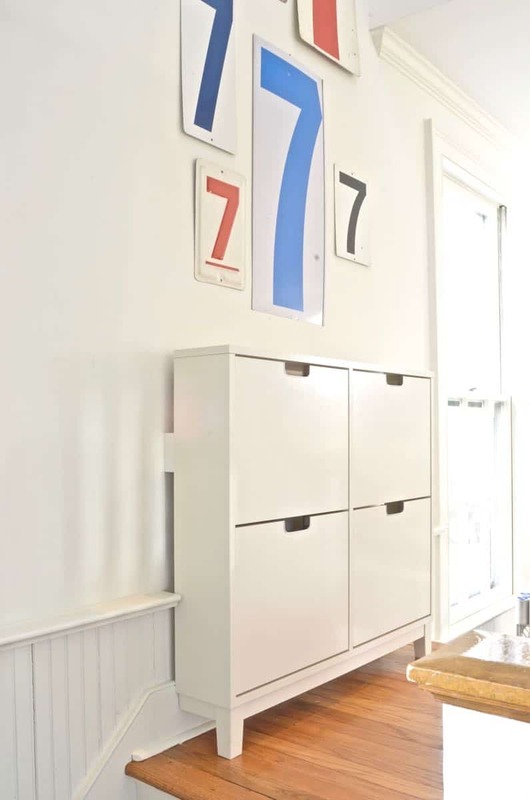 Still love that cabinet you found above the bench! 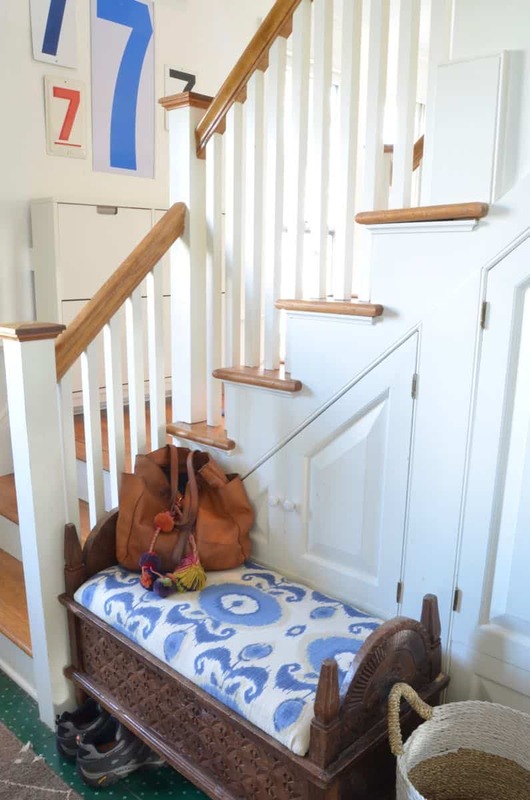 I love the idea of having a basket by the stairs to collect things that need to go to another floor. And FWIW, I think the green floor tiles are kinda cute! You are my hero for managing to stay so organized with a family of 7! 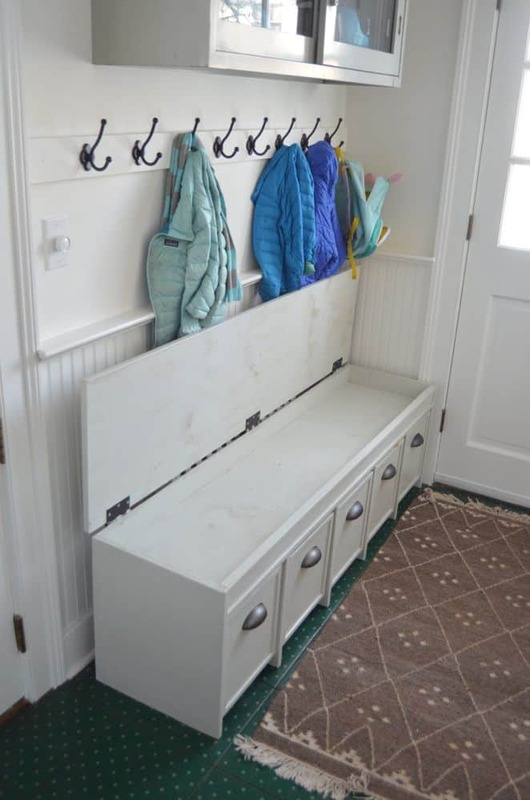 This mudroom is adorable! Love all of your systems! Have a great week, Charlotte!